I keep saying that I can never seem to reconcile my sadness that summer is ending soon with my happiness that fall is starting soon. 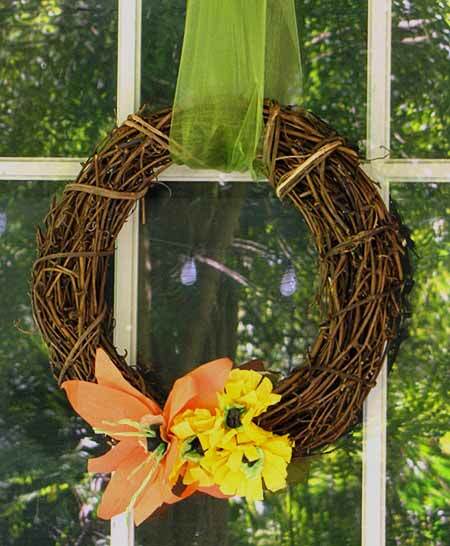 This fall wreath is the perfect in-between decoration for when you’re done with summer, but it’s too early to break out the Halloween stuff. 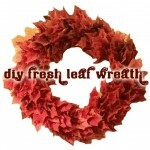 Plus, this wreath craft is massively easy and fast. 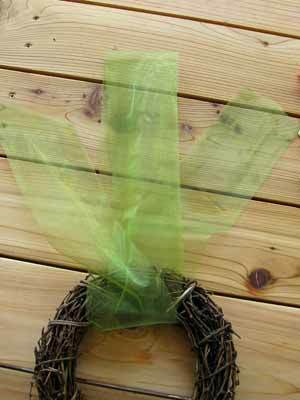 You can literally whip this thing up in less than an hour with the simplest of materials – tissue paper, ribbon, and a ready-made grapevine wreath form. 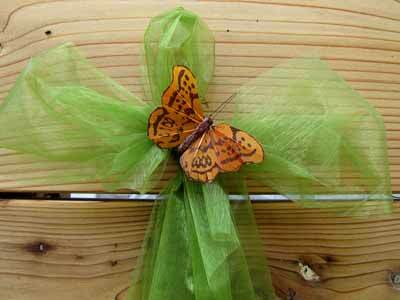 Optional: Feather butterfly decoration (I got mine at the dollar store!). 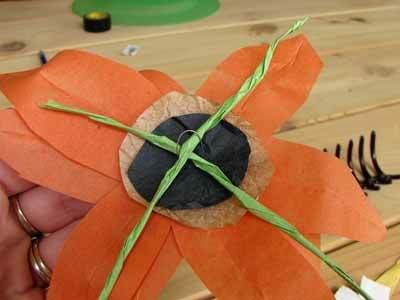 You’re going to start by making 1 tissue paper tiger lily and 3 tissue paper black-eyed susan flowers. For the tiger lily, cut out two five-petal pieces of orange tissue paper, a 1.25 inch piece of brown tissue paper (or a brown paper bag works), a 1 inch piece of black tissue paper, and a 12 inch strip of green tissue paper. Crumple and then uncrumple (a few times) the two small circles so that they look more natural. 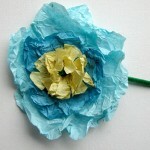 Twist the strip of green tissue paper into a string-like appearance as shown. Break it into two pieces, they don’t need to be exactly the same length, but close. 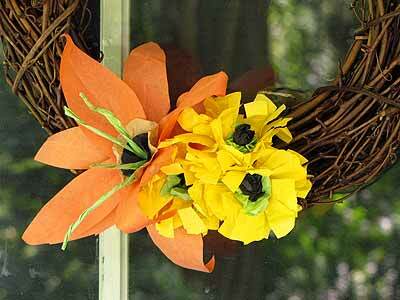 Curl the petals of the orange flower very lightly as you would curling ribbon with scissors. 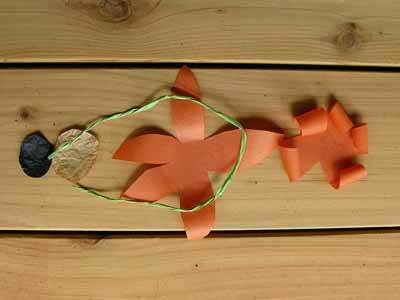 Do this to both pieces, though only one is shown that way (so you can see the shape). Now, score each orange petal with a fingernail or bone folder as shown – this gives it a remarkably tricky realistic appearance! 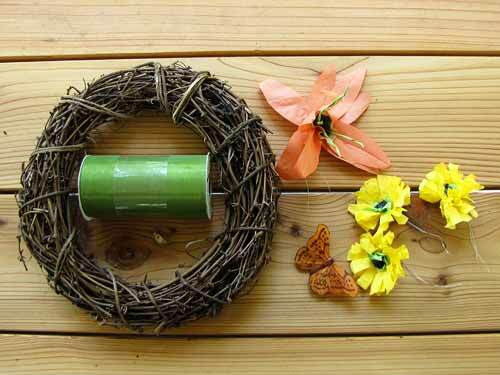 Layer the pieces as shown below, poking holes with your floral wire. 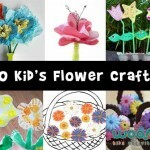 You will need about 8-9 inches per flower. Twist the wire like a twist tie on the back and this one is done! I know there isn’t any green stuff in the middle of a black-eyed susan. I just though it looked more polished this way! 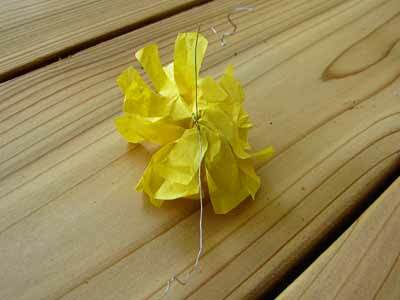 For this tissue paper flower, cut three yellow circles about 2.5 inches in diameter, and tear off a 3 inch or so square of green and black tissue paper. 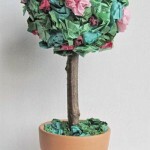 Crumple up the black one tightly and the green one very loosely. 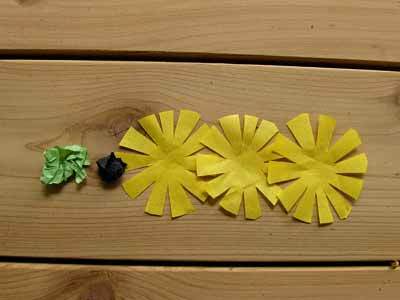 Clip the petals as shown into the three yellow circles (you can do this on all three at once, just make sure to rotate them when you assemble the flower to give it variation). 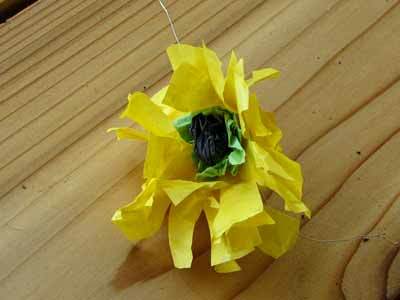 Layer the three yellow pieces and green piece together and attach them with another 8-9: piece of wire as you did with the tiger lily. Leave off the black crumpled piece of tissue paper because it would be too hard to get the wire through it. Assemble it all, and then glue the black piece into the center instead. Make two more for three total. 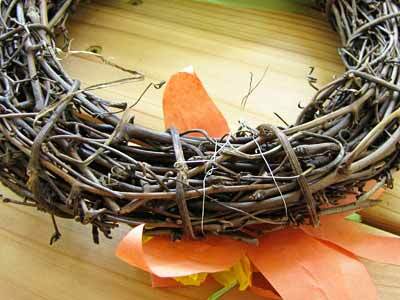 Take the wire on the back of the flowers and attach them to the bottom of the grapevine wreath form. This is just like using a twist-tie (which also means you can reuse these parts in something else if you want to!). Put the tiger lily on one side and the three black-eyed susans next to it, tucking the wire ends into the grapevines so that they don’t poke out and hurt someone. 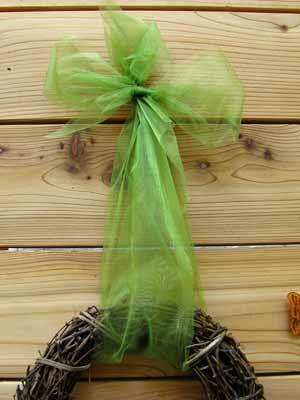 Since my organza ribbon was too sheer to see with one layer, I double wrapped it around the top of the wreath. 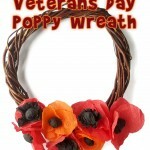 This was about a 7 or 8 foot length of ribbon. I then cut another 2.5 foot or so piece of ribbon and tied it in a bow around the top, gathering the ends of the longer piece. I had a little orange feather butterfly hanging around that seemed like the perfect addition to the top of the bow, so I just hot glued it in place. 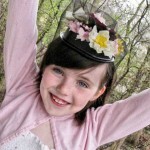 Plus it works well to cover up any bow-tying imperfections! All done! Just go hang it somewhere where you can enjoy it!